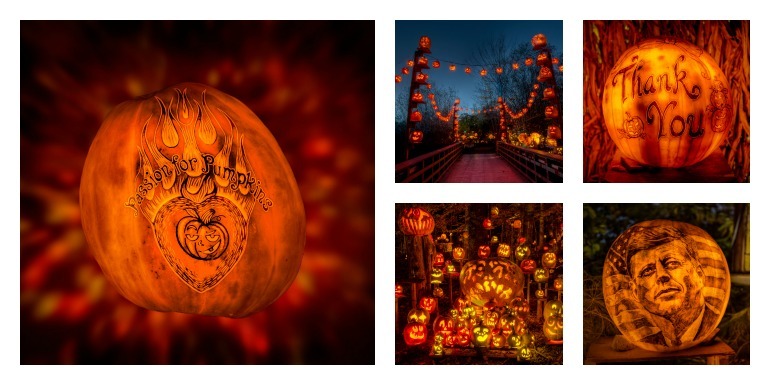 Passion for Pumpkins Inc. is a multimedia production company with 25 years’ experience in redefining fall by transforming any landscape into an illuminated organic gallery. Begun as a small family run event used to raise funds for the Oxford School department in Massachusetts, the founders of Passion for Pumpkins and their partners have produced “pumpkin shows” in New England that have been attended by over a million patrons. In 1999 the Library of Congress awarded the event as a “Local Legacy”. We have produced shows independently in Oxford, Ma and Rockingham Park NH., as well as shows in association with The Bayside Expo Center, Pawtucket Red Sox at McCoy Stadium and The R.I. Zoological Society at the Roger Williams Park Zoo. Passion for Pumpkins is at the forefront of pumpkin art for the fall season. Our method of producing ”intricate” jack-o-lantern carvings is a tradition that is unequaled anywhere in the world. A number of our artist have been evolving the medium for over 25 years and new artistic expressions are advanced and refined on a yearly basis as the best carvers anywhere are recruited and trained to work with our art department. Our standards for production of “intricate” carvings and display of pumpkins are set to meet the highest standards of family friendly entertainment. Contact us!